As winter finally gives way to spring, it was a perfect day in Arch City to finish the garden and yard clean up. Categories: Musings | Tags: Backyard gardening, St. Louis | Permalink. Landscape Fabric, A Gardening Do or Don’t? 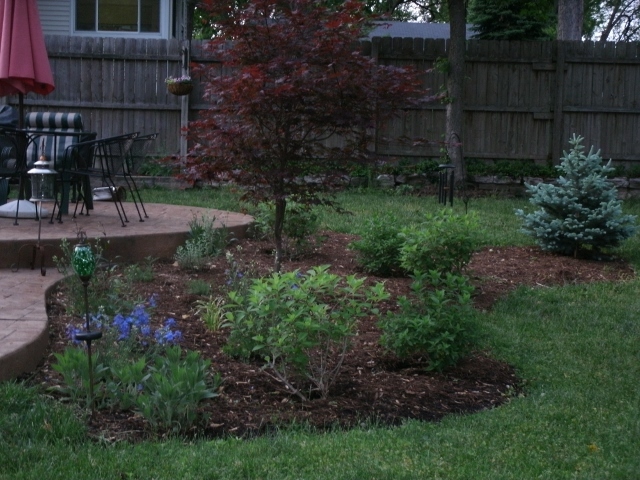 Making a garden bed in St. Louis requires one to dig in hard, dense, clay soil. Not really my idea of a good time, if you know what I mean. (And if you have clay soil you know what I’m talking about.) In fact, the idea of digging up the lawn on a large space running the length of the patio, left me less than motivated. As I have shared, when I began my adventure in backyard gardening, I was not one to really enjoy getting dirt beneath my nails, much less the back pain associated with lots of digging. I wanted quick gratification so I could enjoy my chardonnay while basking at the delights of my hard work. I know, I know, as the saying goes, no pain, no gain. I am learning. But I did look for a shortcut … in the form of landscape fabric. I simply covered the space in the stuff, cut into the areas where I placed my foundation plants, amended the soil where plants were put in and covered the whole thing with lots of mulch. The bed is doing beautifully. This photo was taken last summer, the second season the garden was in place. I continue to add to it each year. I am not sure I would take that shortcut again. Yes, the garden bed is doing beautifully, but I am weighing my options as I consider installing more gardens into the yard. The pros: I have had very few weeds; it was easy to install; it saved my back the aches and pains of all that digging; I avoided using chemical application to kill the grass, which I was contemplating. And, the bed is doing beautifully. Each year I add to it with the vision of a cottage garden spilling forth with flowering plants and shrubs. 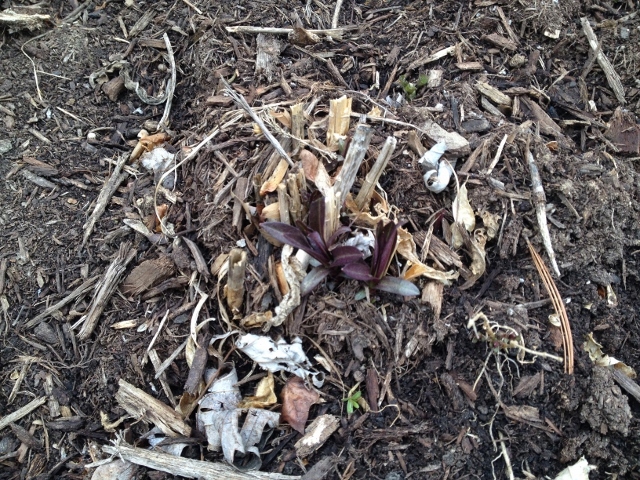 I hand weed, mulch and this spring amended the soil with a bit of compost. The cons: I don’t think I have done my soiI any great favors (should have probably put a hefty layer of compost down along the whole bed–rookie mistake peppered with a healthy dose of inpatience); every time I add to the bed, I am having to cut into the fabric and then dig into the hard, hard clay; my senses are awakening to the concept of “sustainability” and I am not sure these types of fabrics are a good idea. Also, I wonder if the fabric will inhibit growth of the plant. Does anyone have any knowledge of that? I will be getting out the ibuprofen as I plan to start on a bed along one of the fence lines this spring and will avoid some of the shortcuts I took. What’s your take on landscape fabric? Any advice on starting a garden bed from scratch? 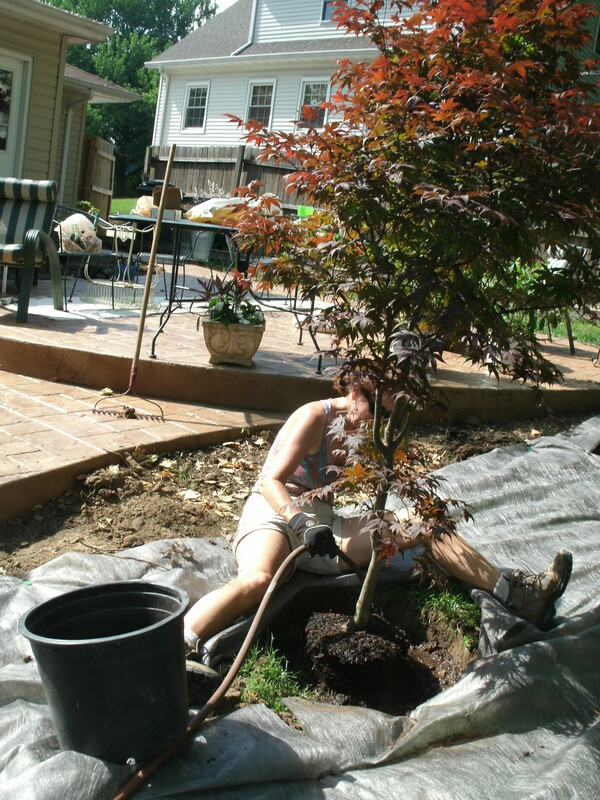 Categories: Musings | Tags: Backyard gardening, clay soil, Japanese maple, landscape fabric, St. Louis | Permalink. Temperatures in Arch City were above 70 yesterday, making it a delightful day to get out into the yard and garden and enjoy a sunny spring day. Because it is early, I spent most of my time raking the lawn and getting up the leaves and twigs. The last frost date in St. Louis is April 13 and the weather forecasters are predicting cold temperatures throughout the coming week. Given the miserable winter we had, I am not taking any chances and have kept a covering of leaves around the azaleas, rhododendrons, roses and tender perennials. 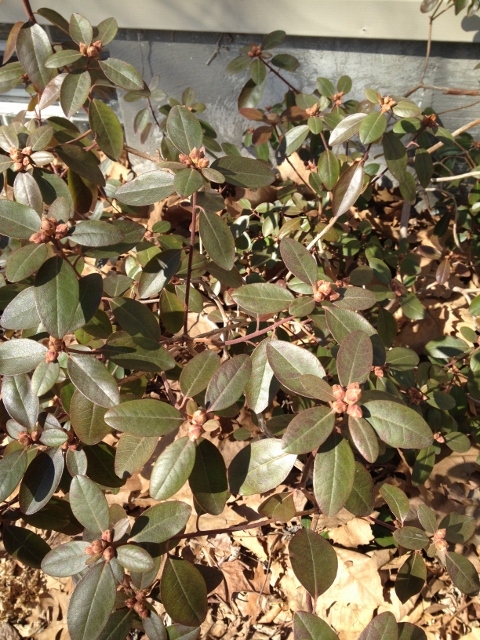 About a month ago or so ago, I read an item in the garden section of the St. Louis Post-Dispatch about leaf scorch on rhododendrons caused by frostbite or extreme winds. At the time, it did not appear that any of my rhodos were affected by that but we then had warming and bitter freezing. And yes, winter has left its mark on two of my P.J.M rhododendrons. On the photo on the left you can see the scorching on the leaves. This plant is the least protected from the elements, sitting on the edge of the eaves where it is more exposed to the winds, rain and ice. The plant on the far right is the most sheltered, by its neighboring shrubs and the eaves. It is fine. I was so busy in the yard that I did not call my local gardening center. Scanning the Internet, about the only advice I have come across is to be patient and not cause any further stress on the plant, such as pruning. 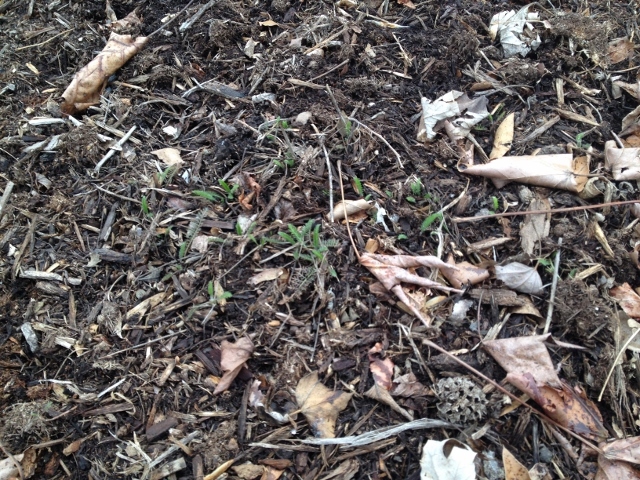 There are buds here as you can see but I wonder what the impact will be on the plant a year later. 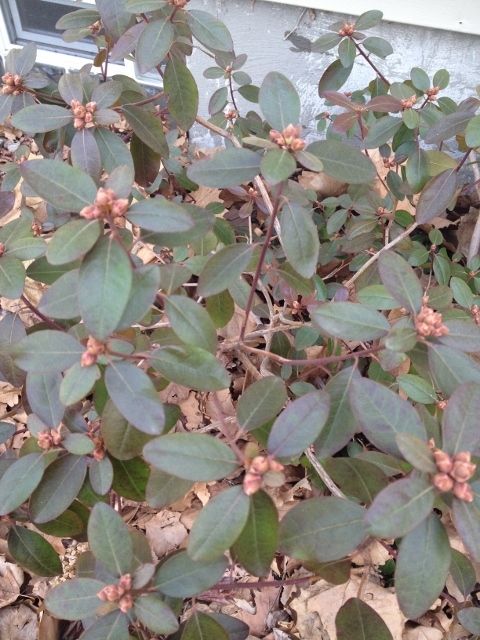 Did you know rhodendrons have been around for 50 million years? Neither did I. These shrubs have been growing very nicely in their current location, so I have faith these two shrubs will be hardy enough to overcome this. 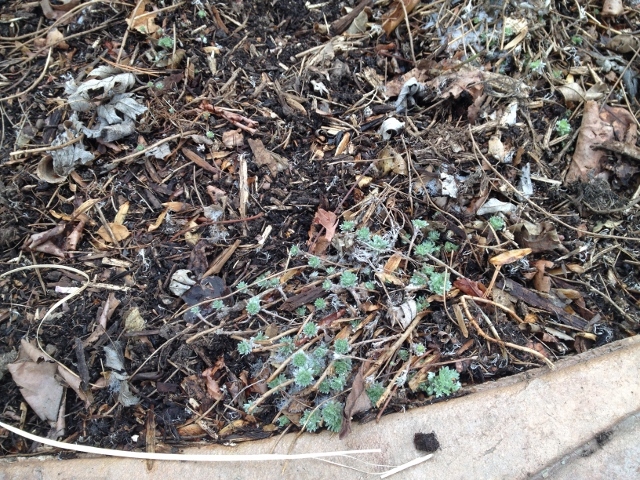 How did the winter affect your plants? 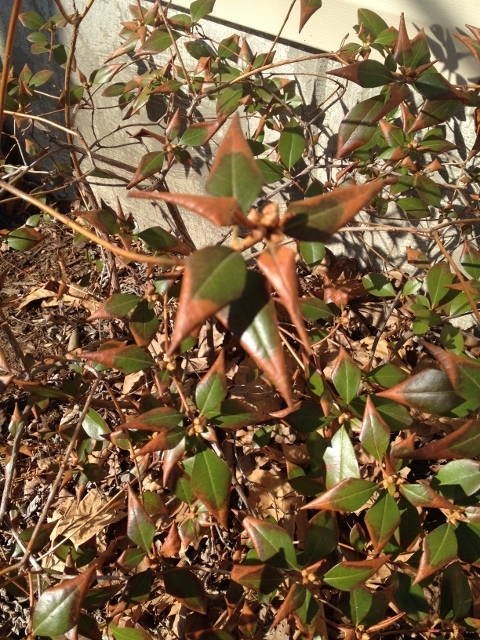 Categories: Musings | Tags: P.J.M rhododendron, scorched plants, St. Louis Post -Dispatch, winter plant damage | Permalink. 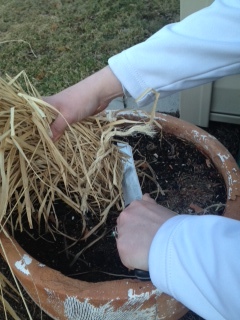 Use a serrated bread knife to cut back ornamental grasses. To make the process easier, first tie a string around the grass to hold it in place. Like so many of you out there, I am itching to get in the garden. And there is lots to be done. I’ve started to cut back my ornamental grasses. I let my ornamental grasses die back and leave them in place for winter interest. True confession, sometimes I just don’t get to the annual grasses I use in my pots and struggled getting them out of the pot in spring replanting season. But I digress. After years of using my garden shears, pruners, or kitchen scissors to cut back these ornamental beauties, I turned to the kitchen bread knife. It works like a charm and couldn’t be easier. Here’s another handy tip. First tie the floppy wintered-over grass with a string to contain it like a ponytail, then cut back the grass with the bread knife. Do you have a tried and true gardening quick tip? Categories: Quick Tips | Tags: container gardening, cutting back, Ornamental grasses, pruning | Permalink. After the patio was installed, I spent the winter pouring over gardening magazines and reading books checked out from the nearby public library. Who knew there was so much to consider? I got hooked. And I bought two books I refer to regularly on gardening. The Missouri Gardener’s Guide by Mike Miller and the more complex but very thorough The Well-Designed Mixed Garden by Tracy Disabato-Aust. Mike Miller’s book was a great way to start. The book is simple to read, has nice photography and is broken into easily digestible sections. A recognized expert in gardening, Miller provides us home gardeners lots of guidance on plant selection for the Missouri landscape. Applying his ideas to my backyard, I organized my thinking around selecting plants that are either native to Missouri, are drought hardy and (key here) easy to maintain. In addition to the description of a particular specimen, every selection includes Where, When and How to Plant, Growing Tips, Care, Companion Planting and Design (love that!) and a Did You Know tidbit. And all of it is contained to one page with a beautiful glossy photo. Thank you, Mike. Your easy-to-read books–he has another one on Missouri gardening–have been great resources for this novice gardener. Disabato-Aust’s The Well-Designed Mixed Garden is another matter completely. This meaty book is big…in size and ideas. By the time I picked up this gardening resource, I knew I wanted to create a cottage garden with a mix of color, shape and flowers. I wanted a heavy emphasis on low care shrubs and colorful perennials. And I was looking for advice on design and plant selection. The book’s section on design is not for the meek. It’s probably aimed more for the professional but it contains some great food for thought. She explains the importance of understanding design principles (think order, unity, rhythm) in designing an aesthetically pleasing garden. Then she gets into scale and does a deep dive on color selection. Overwhelming? Yes. Intimidating? Check. So why do I continue to dog ear the pages of this book? Disabato-Aust really got my wheels turning on thinking about color and texture. I also started to map out my design ideas on graph paper. That was a painful process but I still refer to that horribly drawn “map.” Mostly, I really love all the appendices in the book, which are terrific resources for design characteristics, maintenance and the names of plants. 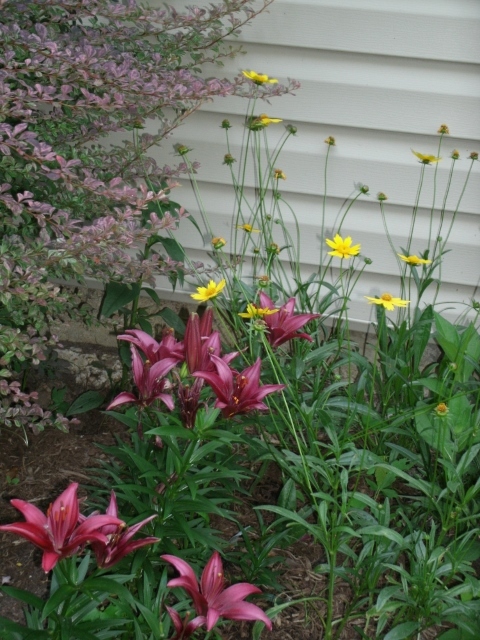 There are lots of photos showing plant combinations. I like that this design pro shares with you some of her mistakes; seeing garden do’s and don’ts is helpful. Categories: Resources | Tags: plant design, This Missouri Gardener's Guide, Tracy Disabto-Aust; Missouri Botanical Garden | Permalink.